Your sense of style should evolve as you do over the years. Whether you’re dressing for the office or a day of leisure, choose an outfit that reflects your personality. Don’t get too comfortable with pieces from the past. Keep up with current trends that are still age appropriate for the more mature shopper. 1. The wrap dress is a figure-flattering silhouette that looks beautiful on women of all ages and body types. It fits a woman’s curves in all the right places and camouflages common problem areas including wide hips and thick midsections. Here’s a tip: Try a style with ruching, which is extremely slimming. 2. If you’re looking for a light layer that can easily add a little more coverage, give a trendy boyfriend cardigan a shot. The oversized, unstructured sweater provides length that covers the hips and is an easy way to conceal the arms. 3. To give the illusion of longer legs, choose a wide-leg trouser. A wide pant will lengthen you, while concealing the thighs and calves. A pair with stretch will allow for extra comfort and ease of movement. 4. An A-line skirt should be a staple in every woman’s wardrobe. The flowing fabric glides over the body without hugging it. Whether you choose a maxi or mid-calf length, there is no better silhouette for a mature woman. Pair with heels or flats depending on the occasion. You don’t have to sacrifice style to dress age-appropriately. 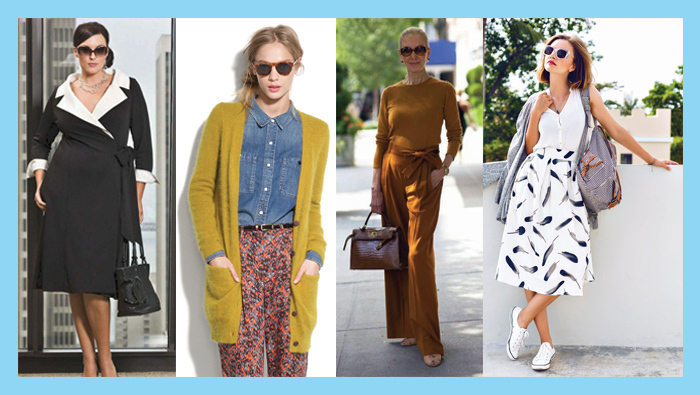 Try these trends that extend to women of all ages. They will highlight and enhance your best features and make you look like and feel like a fashionista.